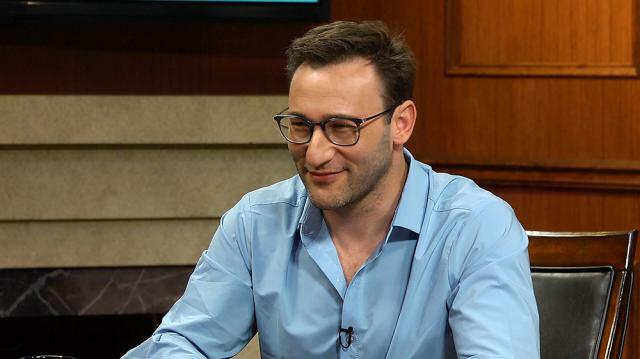 Simon Sinek says what concerns him most about millennials is their growing addiction to technology and social media – an affliction for which there are currently few solutions. Larry King: Millennials get a bad rap, being entitled, unfocused. You say that’s not true. Simon Sinek: Every single generation is affected by whatever’s going on in the world during their formative years. So if somebody grew up during the Great Depression or the Second World War, they may grow up to be miserly, for example, or frugal, wanting to squeeze every drip of toothpaste out of the tube. Well of course, it’s because they grew up during rations, of course they’re going to be like that. Well likewise, this generation that grew up during the turn of the millennial, they came of age at the millennial, grew up in a time of technology that we didn’t have. And it’s had an effect on how they view the world, some of it positive, some of it more challenging. My biggest concern is the unfettered access to social media and cellphones, quite frankly, because there’s a biology to these things that are as addictive as alcohol, nicotine, and gambling. Larry King: I noticed that, therefore I don’t have a cellphone. I have a flip phone. Simon Sinek: Which is wonderful. Larry King: It’s all I use it for, is to talk, I like the sound of the voice. Why has it overtaken us? I deliberately will not have it, because I know I’d be addicted. Simon Sinek: It’s about balance, it’s not that they’re inherently bad, and it’s not that texting or social media is inherently bad, but it’s when it gets out of balance. If somebody carries their phone wherever they go, like they physically feel anxiety whenever they put it down, when they’re with their friends and have to have it up the entire time, looking at the phone while they’re with their friends, when they wake up in the morning and have to check their phone before they say, “Good morning” to the person sleeping next to them, these are problems. This is out of balance. Larry King: Will we have to deal then with withdrawal? Simon Sinek: Yes, I mean just like with any addiction, you’re going to have to go through withdrawal before you find health again.